In British Columbia, children with Autism Spectrum Disorder (ASD) receive funding towards their programs through the Autism Funding Unit (AFU) of the Ministry of Children and Family Development. Our programs are usually charged as either tutoring services or behaviour intervention. We are not like most learning centres. Most of our programs are “cognitive tutoring” rather than “academic tutoring.” This means that our programs strengthen the brain’s ability to learn as opposed to just more teaching. Doesn’t your child already go to school and get extra help there? If that isn’t solving the problems, then you really need to look at cognitive tutoring. 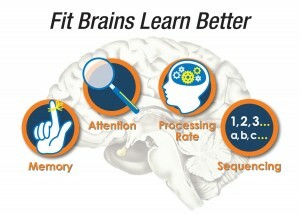 Our programs strengthen the brain (memory, attention, processing, etc.) for improved learning abilities in school and life! After all, the brain is at the core of all the problems. Our programs work the whole brain and affect the whole body and the whole person. This is especially important for kids with Autism (ASD). Science, with the use of brain scans, has clearly shown that children with Autism Spectrum Disorder have brains that are quite different from more typical children. Among other things, kids with autism are very likely to be weak in the left angular gyrus and the right angular gyrus. The degree of difference will be different for each child, but in general, these are areas that show significant differences when compared with children without ASD. The left angular gyrus is where symbols are processed. Symbols are everywhere in the classroom (and world). Letters for reading, numbers for math, algebra is symbols for symbols, maps are symbols, and don’t forget all the symbols in science. When the programs we offer strengthen this area of the brain, we see significant improvements in a broad range of academic areas as the child with autism is able to process the symbolic information. The right angular gyrus enables us to understand the feelings and thoughts of ourselves and others. It is because of this weakness that so many of these kids attend social training programs. But social training programs only teach the child how to behave in certain situations and do little or nothing to instill empathy (the ability to understand how another person feels). Our programs strengthen the brain including the right angular gyrus. When that happens, these kids start to demonstrate empathy, their understanding of others. They are then able to respond in more “normal” and appropriate ways. Read the newspaper story about our PACE student in Program a Treasure for Autistic Boy. Read about our student Mackenzie in Talk About Love and Bringing Back Mac. Mac did Fast ForWord after completing Samonas. John has autism and had no capacity to understand other people and their needs. Then, on his way into our centre one day, he stopped to help his little brother who had tripped and fallen on the curb. Nothing like that had ever happened before he did The Listening Program. Mark is 12, has autism and is non-verbal. He started talking and became affectionate after The Listening Program. Robby has autism. A few weeks into his program, his parents started to witness new and unusual behaviours (for him). He went to get himself a glass of water and brought one back for his dad. A few days later at McDonald’s he noticed that his brother forgot to get ketchup and so gave him one of his. He is more aware of the needs of other people. Dave has autism. His mother said he had “gifting deficit disorder.” He would not give anything to anyone ever. The first gift he ever gave was to Ross at ALC after completing PACE. Steve would tickle or tease his sister and wouldn’t stop even though she was crying. (He didn’t understand that she was unhappy with his actions.) Within a few weeks of starting Fast ForWord, he suddenly became a kind and compassionate big brother. We see these kinds of things all the time. Realize, thinking and feeling happen in the brain. By awakening areas of the brain that are lying dormant, these programs change these children in wonderful and unexpected ways. Please read some more Samonas testimonials, PACE testimonials, and phone us at 604.539.1386 or 1.855.539.1386 to book an assessment or discuss your child and these programs. One of our areas of greatest reward is in working with children with Autism Spectrum Disorder (ASD). Many of their parents say that our programs have been the most successful and life-changing therapies their children have done. To see which program is most suitable for your child, see our assessments and our programs. In most cases, academic improvements are so significant that they astound the child’s parents, teachers, and other therapists. However, the most rewarding improvements are more personal i.e. independence, communication, social, sensory integration, and self-confidence. Bruce is my six year old son. He was diagnosed with Autism Spectrum Disorder when he was five. He had his 11th Fast ForWord session today but I could have written a testimonial after just two sessions. His mood has lifted so dramatically since starting Fast ForWord that I describe him as acting like birthday invitations are arriving in the mail all day long. He is relaxing more when we go out. Two days ago we were grocery shopping and I realized Bruce wasn’t holding my hand. He always holds my hand when we’re out but not this time. He was nonchalantly walking two paces behind me just looking around at everything. He didn’t take my hand again until we were outside of the store. His 1-1 support worker in Kindergarten said she isn’t helping him through transitions nearly as much. She said she reasoned with him for the first time the other day. He didn’t want to sit on the carpet but his classroom teacher had noticed the difference in him and decided to make him sit at circle time for 5 minutes. He listened to the expectations and sat down. I used to hear him wailing in frustration periodically throughout each day, even if I was on the other side of the school I could hear him. That level of frustration just isn’t there anymore. I know ‘teacher talk’ at the carpet is very difficult for Bruce to process. Teachers present new information all the time so for Bruce sitting and listening without frustration is a sign that something is happening. Bruce had been receiving speech therapy for three years. For an entire summer prior to entering Kindergarten Bruce tried and failed to remember the names of two objects. Tried and failed every single time. I knew working memory was associated with higher level thinking so it was particularly important to me that we keep trying. In Bruce’s very first session of Fast ForWord he was presented with the task of remembering two sounds in a sequencing activity. I held my breath. His third try, SUCCESS! I can’t thank Accomplished Learning Centre in Langley, BC enough for all they have done to accommodate Bruce. They knew Bruce would be loud if he became frustrated and he was non-compliant with pencil paper testing prior to starting but they welcomed him and found a quiet time for him when they could give him 1-1 attention. They sat with him and encouraged him through those frustrating moments as he learned the games. He would even turn off the computer screen and get up out of his chair but after just two sessions of encouragement and success in the program Bruce no longer needed 1-1 attention. After just 5 sessions Bruce started walking into the centre, putting his headphones on and starting the program all by himself. When he’s finished he takes off his earphones and says, “That was fun!”. His awareness of sentence structure and time is improving already. For example, last night he walked into my room and asked me “Mommy, where is my magnifying glass?” This morning when he was getting ready for school he asked me, “What day is it tomorrow?” and “What are we doing after school tomorrow?” This awareness of time and sequences of activities is a huge improvement for him. Before these 11 sessions of Fast ForWord he would ask, “What is it?” for just about everything and we would have to guess what it is he wanted. All this improvement and we’re just 11 sessions in. For more information, phone Accomplished Learning Centre at 604.539.1386 or 1.855.539.1386.